Starting with the release of COMSOL Multiphysics® 4.3b you can work with multiphysics simulations right from the user interface of the Autodesk® Inventor® CAD system. 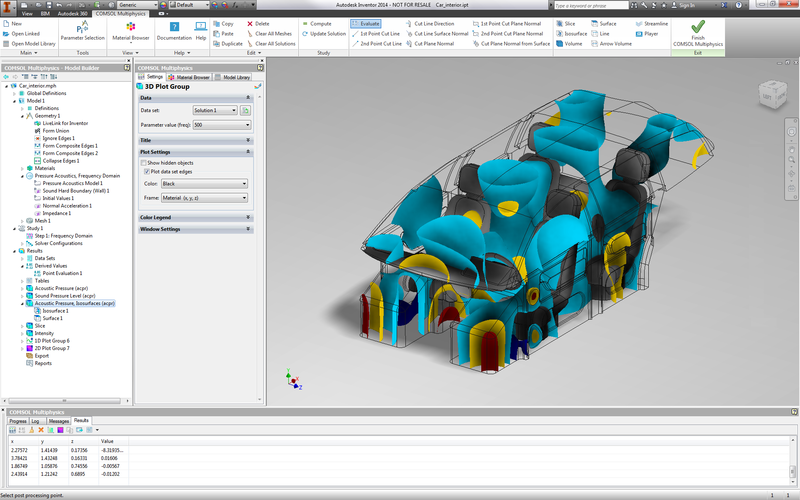 Called the One Window interface, this functionality is available with LiveLink™ for Inventor®. The result of the work by our external interfaces and integrations development team, the One Window interface, is a completely new environment for simulations that are embedded in the Inventor® user interface. It contains the Model Builder, Settings, and all other views you are familiar with when modeling in the COMSOL Desktop™. The COMSOL Multiphysics tab, see above, contains tools to set up, compute, and study the results of your simulation. Using tools from the tab together with the Model Builder to configure simulations is similar to the way you would work in the COMSOL Desktop. There is one important difference that I think many of you will like — the mouse controls for interacting with the 3D graphics are exactly the same in the COMSOL Multiphysics environment as in the general Inventor® environment. Since, after all, you are working in a CAD program, geometry operations are not available in the COMSOL environment. You can, however, modify the CAD design in the Inventor® environment after exiting the COMSOL Multiphysics environment. When you are satisfied with the changes you have made, switch back to the simulation, and changes in the design are automatically propagated. There is no need to manually synchronize as you previously had to do in prior versions of LiveLink™ for Inventor®, when you worked with the COMSOL Desktop and Inventor® side-by-side. Furthermore, the virtual geometry operations that hide geometric features from the meshing process, such as collapsing faces or hiding edges, are also available from within the One Window interface. The One Window interface adds the COMSOL .mph file format to the available formats when opening or saving a file from Inventor®. When you open a COMSOL model file, the COMSOL Multiphysics environment is automatically initialized, and you can start working with the simulation. A benefit of setting up simulations directly in Inventor® is that you can easily create a link between the COMSOL model file and the associated CAD file when saving your work. Currently, this functionality is only available when working within the One Window interface, and allows you quick access to all simulation files associated with a CAD design when you click the Open Linked button from the COMSOL Multiphysics tab. 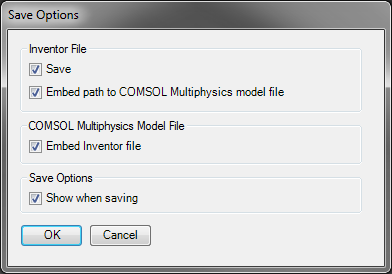 Just make sure to select the option “Embed path to COMSOL Multiphysics model file” when saving the COMSOL model. When you are opening a COMSOL model in Inventor®, you do not need to remember the exact Inventor® file that contains the geometry. This information has been saved in the COMSOL model file. All you need to do is to accept and open the suggested file so that the CAD model is automatically loaded. Yet another option allows you to create a package that you can easily share with colleagues. The Inventor® part or assembly is automatically saved inside the COMSOL model, so there is no need to worry about missing attachments. 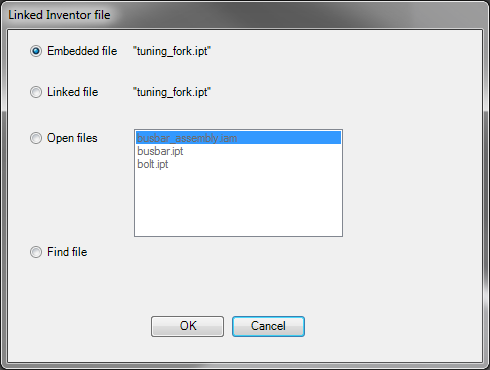 It’s also good to know that the .mph files saved from LiveLink™ for Inventor®, from within the One Window interface, are fully compatible with, and can be opened from, the standalone COMSOL Desktop. I hope that if you are using COMSOL Multiphysics and Autodesk® Inventor®, either separately or together, you are now ready to test-drive this latest integration, and let us know what you think. And if you don’t have a CAD tool but feel it’s time to invest, then this integration will surely speed up your workflow. 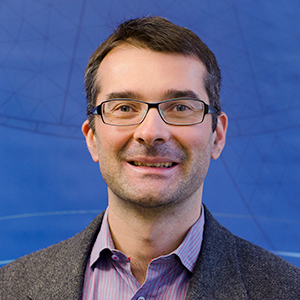 I am also looking forward to any general feedback on improvements you think are the most important for the integration between COMSOL Multiphysics and Inventor®. Autodesk, and Inventor are registered trademarks or trademarks of Autodesk, Inc., and/or its subsidiaries and/or affiliates in the USA and/or other countries. LiveLink™ for Inventor® is not affiliated with, endorsed by, sponsored by, or supported by Autodesk, Inc., and/or its affiliates and/or subsidiaries. COMSOL, COMSOL Multiphysics, LiveLink, and COMSOL Desktop are either trademarks or registered trademarks of COMSOL AB.